The Waifs and Strays’ Society, the original name of The Children’s Society, was founded in 1881. 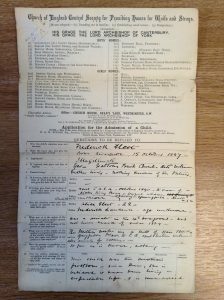 Applications for children to be taken into the care of The Society started in February 1882 and are kept in case files for each child. The the first part of this blog was an analysis of the first hundred case files, all started in 1882. 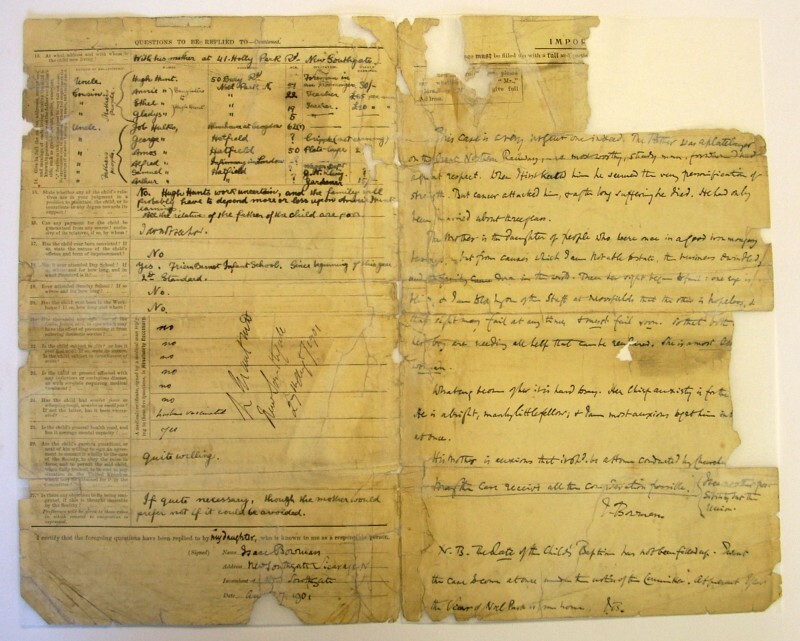 There is considerable variation in the amount and quality of information in the files, many containing just the application form often only partially completed, with brief notes of any subsequent moves on the back of the form. Some files contain correspondence, often about maintenance payments. 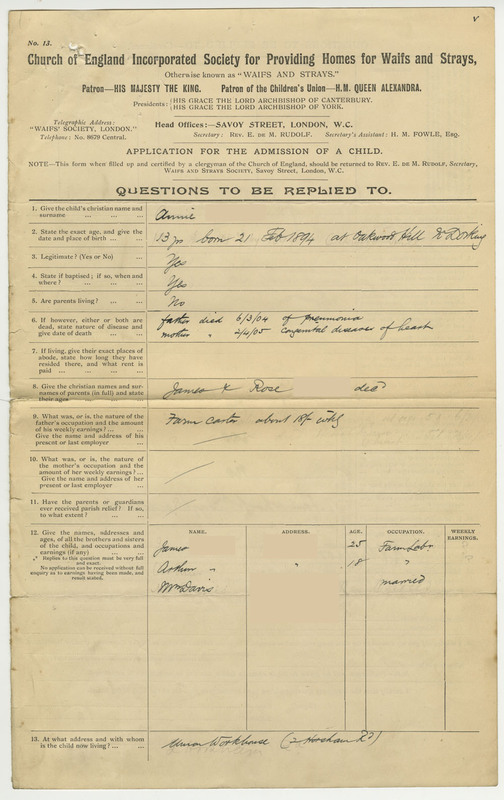 Case 1: The Society’s First Boy – John was eleven years old and living in Brixton, south London, when the application was made by the parish visitor. His father was a labourer who earned sixpence (6d) an hour when he was in regular work. Their large family was poor and seldom remained in the same house for more than a few months. The parish visitor describes his parents as “two of the most wretched and degraded people in the neighbourhood”. 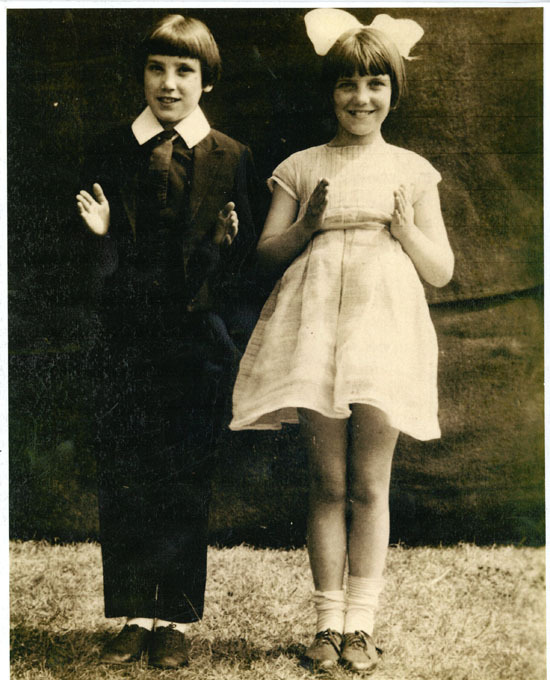 When John was seven, he fell on ice injuring his spine, and was then badly burnt. He never fully recovered from these accidents. 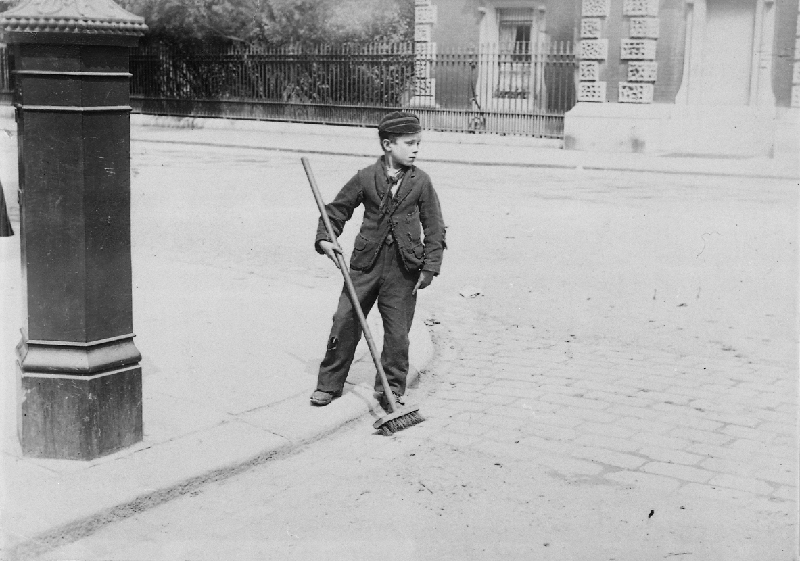 He worked as a crossing sweeper at Clapham Common, but his health deteriorated with neglect. He was taken into an orthopaedic hospital and from there was moved to several convalescent homes. 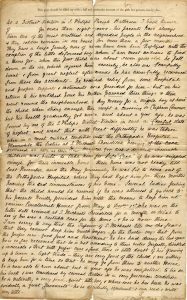 John was then taken into St Michael’s Hospital for sick and destitute incurable children in Shoreditch, but he could not be kept there due to his improving health. He was received into the Clapton Home of the Society in south London, during February 1882, then spent seven months in a succession of privately run convalescent homes in Southend-on-Sea, Essex, followed by a similar time in a foster home in Balham, south London. 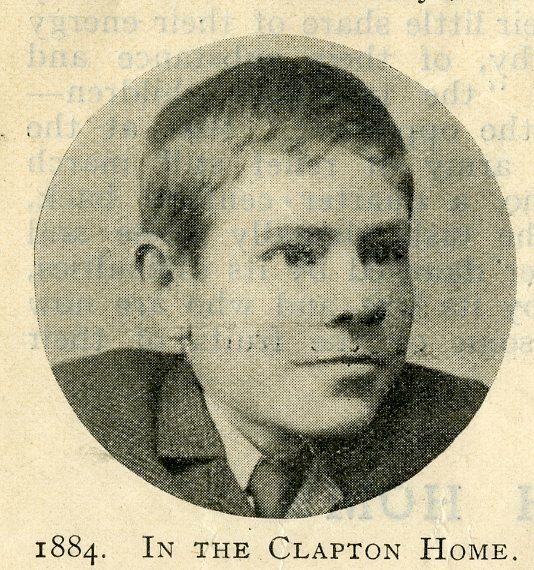 After a further seven months in a training home for disabled children in Kensington (possibly the Crippled Boys Home, Wright’s Lane, Kensington, London), he returned to the Clapton Home. At seventeen, he was given a year’s trial as a clerk at St Mark’s Home, Natland near Kendal, making The Society’s first connection with that home. He went on to develop a career in the printing trade in London, Redhill and Oxford. 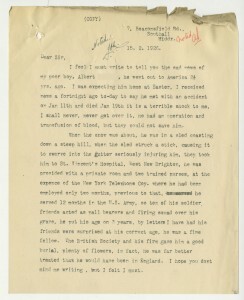 His case file is unusual in that it contains regular correspondence up to his death at 59 from tuberculosis in Frome, Somerset, in 1930. He married in 1897 and had a daughter seven years later. He wrote verse and was fulsome in his praise and support for The Society. The Society also held him in high regard, given his success in life, achieved in the face of considerable adversity. A photograph of John seventeen years later as an adult, that appeared in the same edition of the ‘Our Waifs and Strays’ magazine. Case 2: An Orphan Girl – Florence was seven years old when her maternal grandmother referred her into The Society’s care. Her father, a bombardier in the Royal Horse Artillery, deserted from the army soon after marrying her mother. He was pardoned, but deserted again, went to sea and was drowned. Her mother, a cook in the household of a Royal Artillery colonel, remarried but had died a month before the vicar in Woolwich applied to The Society to take Florence into its care. Florence was received into the Dulwich Home, where she stayed for nineteen months. She then moved on briefly to a home in Harrow, before staying a while in a home not operated by The Society in Bayswater. 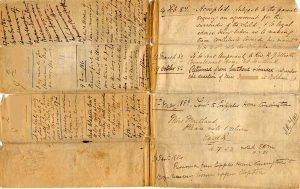 Case 3: A Destitute Boy – John, 16 years of age, was found “quite destitute” on the streets in Whitechapel at 2am and was sent to the Clapton Receiving Home “by order of the Rev. R C Billing, Rector of Spitalfields and Rural Dean”. His mother had died in Cardiff and his father “not known”, but thought to be living. He had a sister but did not know where she was. He had been living in Kent, but had left his job in the ropeyard at Minster on the Isle of Sheppey, Kent, eight months previously. He joined a troupe of tramps known to the police, but left them after four months. He had “been getting his living by working around the Billingsgate fish market in London, going to the Derby and other races and there assisting pedlars, coconut men, etc”. He absconded from the Clapton House home after a month and joined the Notting Hill Shoe Black Brigade. Case 4: Neglected Child to an Apprentice Carpenter – Edward’s father, a compositor had died three years previously, and his alcoholic mother neglected her six children. 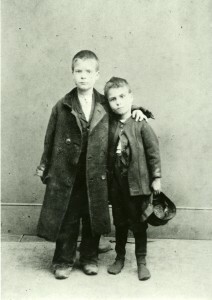 They were “left to run about the streets, almost destitute of food and clothing.” His mother kept losing work through drunkenness and pawned clothes given to her for the children. Edward fell seriously ill brought on through neglect, ending up in Westminster Hospital. Edward was signed over to the care of The Society by his mother just before his eighth birthday and was received into the Clapton Home. 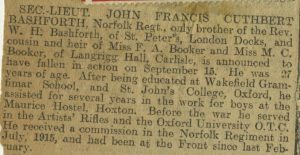 He transferred to the Boys Home in Frome, Somerset, where at the age of 13 he was taken on as an apprentice for a local carpenter and builder. 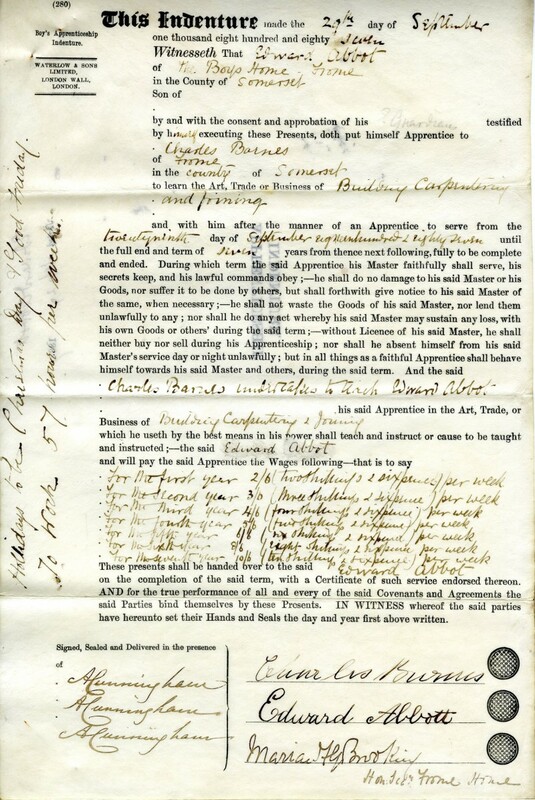 The apprenticeship indenture commits Edward to working 57 hours per week for his Master for seven years, starting at 2/6 per week (12.5p) rising to 10/6 (52.5p) per week in his final year, with two days annual holiday – Christmas Day and Good Friday. 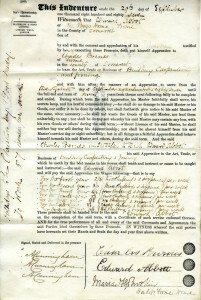 Edward’s apprenticeship indenture, dated 29 September 1887. 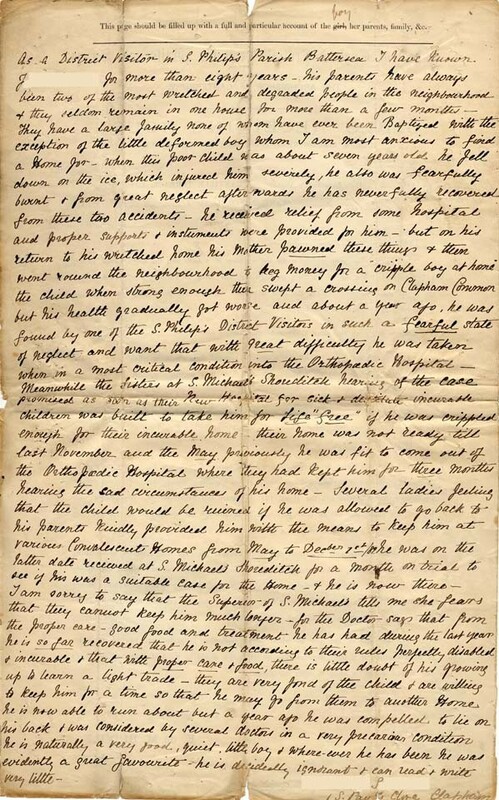 Case 5: Happy emigrant to America – Since William’s mother died of tuberculosis four years previously, his “seldom sober” father had led “a wandering vagrant life”, deserting, neglecting and ill-treating his children. Four of William’s older siblings had been rescued by the Perseverance Association and William was taken into the Clapton Home aged seven. Two and half years on, he was transferred to an orphanage near Banbury for a couple of years, before moving on to the Standon Farm Home in Staffordshire for three years. He returned to London to the Jersey Working Boys Home in Blackfriars for four months before emigrating to a farm in Texas run by the brother of a lady supporter of The Society in Devon. 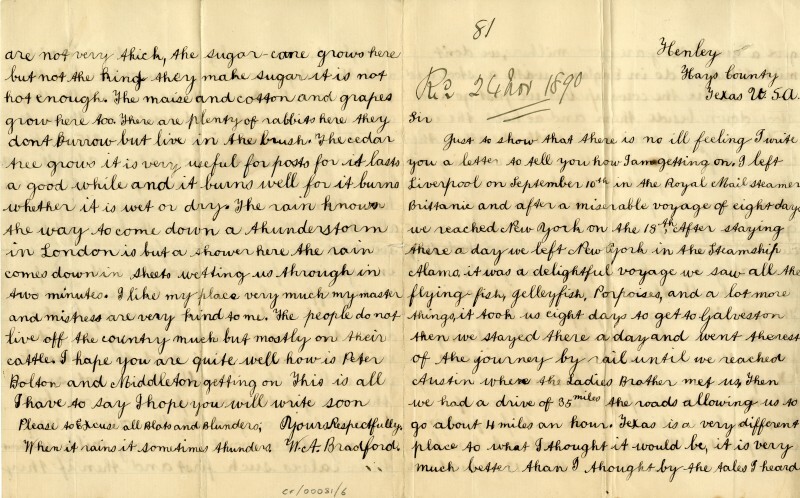 In a splendid letter, half of which is reproduced below, William describes the journey and how different farming is in Texas. 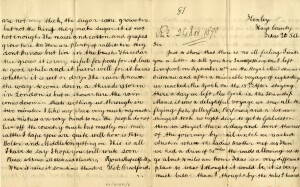 “After a miserable voyage of eight days” from Liverpool to New York, “it was a delightful voyage” onward to Galveston – “we saw all the flying fish, jelleyfish [sic], porpoises, and a lot more things”. He went on by rail to Austin, then “had a drive of 35 miles, the roads allowing us to go about 4 miles an hour”. 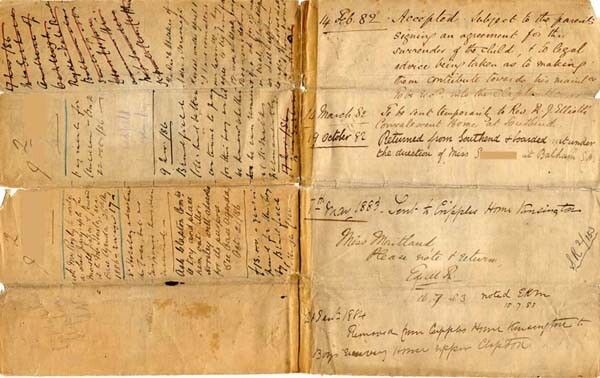 Case 6: Army daughter left in care – Nine-year old Catherine and her little brothers were left living in the army’s Woolwich Barracks with only a thin partition dividing their bed from all the men when their father, a gunner in the Royal Horse Artillery, was put in prison. Their mother had died of sunstroke, probably when stationed abroad with her husband. Catherine went into the Old Quebec Street Home in Marylebone in London, and the War Office deducted 3d (1p) daily from her father’s salary as a contribution to her maintenance. 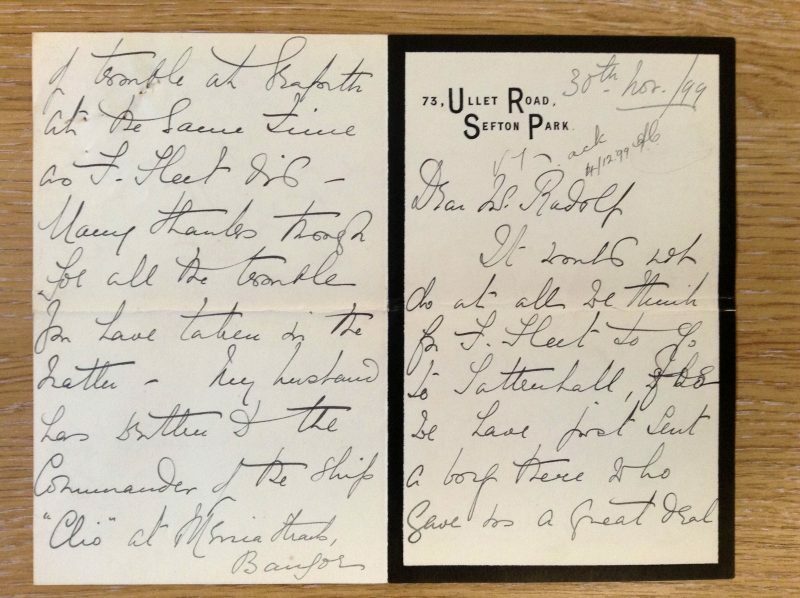 A little over a year later her father was discharged from the army (time expired) and emigrated to America with her eldest brother to live with her aunt and her sickly husband. A letter from a company in Massachusetts indicated that her father had left their employ “in consequence of irregular and intemperate habits”. When Catherine reached 14, she had a spell at the Sea Bathing Infirmary, Margate, which usually dealt with tubercular patients. 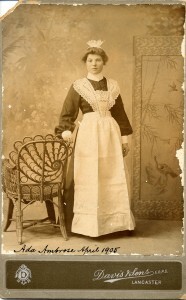 A few months after returning to the Marylebone Home, she went to work locally in domestic service, before going to India with a married couple, presumably as their servant. 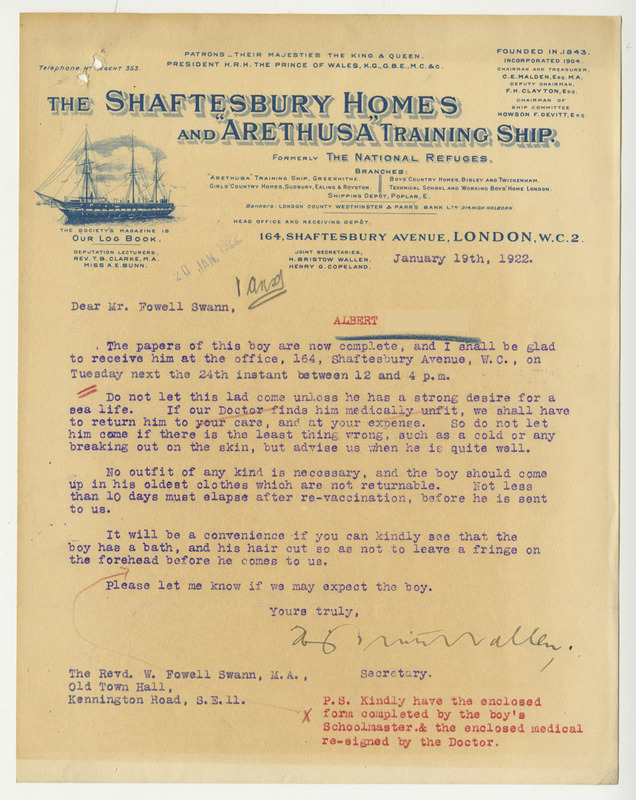 Case 7: A Familiar Route into Service – Twelve year-old Emily had lost her father, a merchant seaman formerly in the navy, who was washed overboard and drowned. Her mother struggled to support her four children and was constantly anxious when out at work about Emily who was pilfering small articles from the neighbours. 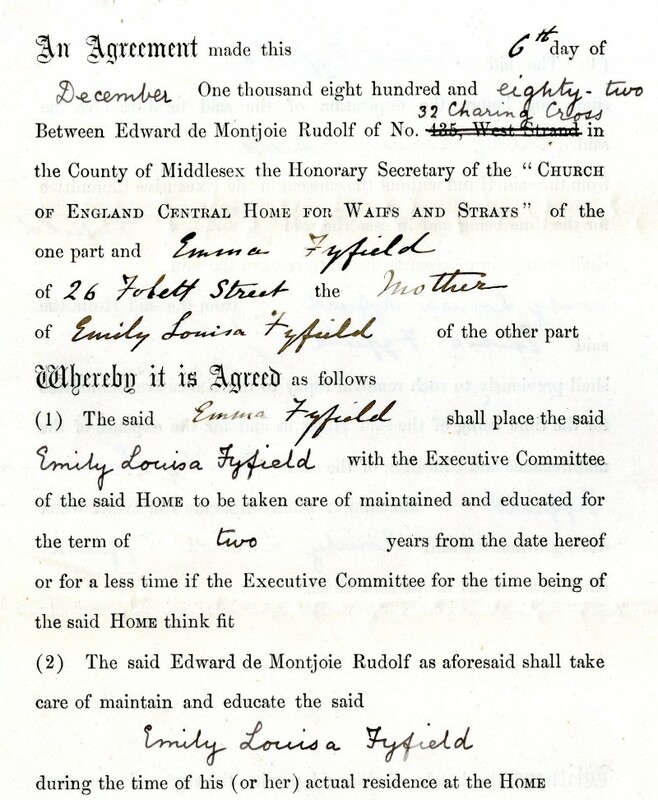 Emily was taken into the Marylebone Home for Girls for a couple of years under the terms of the agreement extract below, and then spent a few months in a foster home before going into domestic service in Bournemouth. 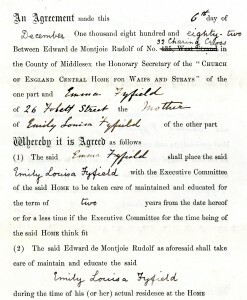 An agreement placing Emma in the care of the Society’s Central Home for Waifs and Strays, dated 6 December 1882. Today we have the first part of a blog post written by one of our volunteers, David Lamb. The second part that looks at a few of the individual stories of the first one hundred children will follow shortly. The Waifs and Strays’ Society, the original name of The Children’s Society, was founded in 1881. 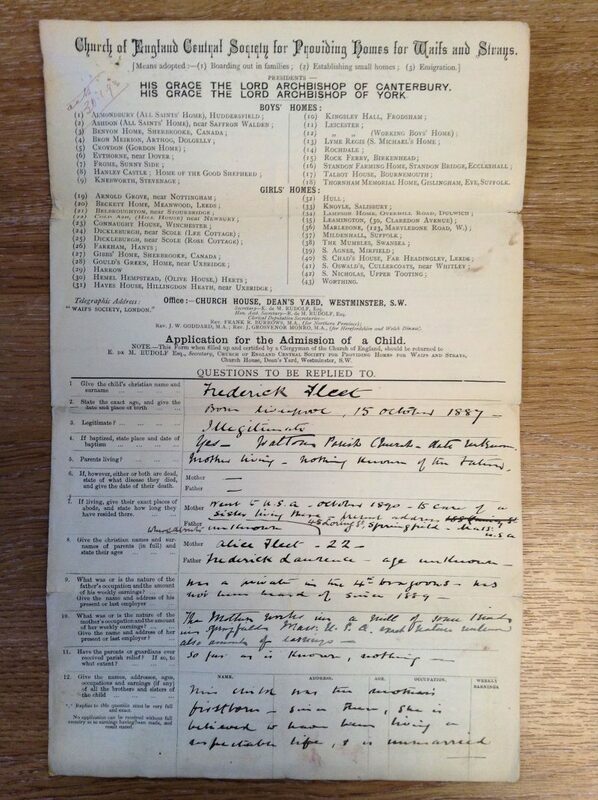 Applications for children to be taken into the care of The Society started in February 1882 and are kept in case files for each child. 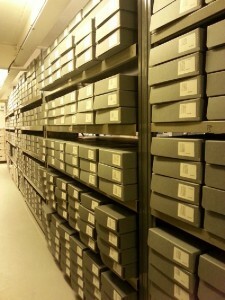 This piece is an analysis of the first hundred case files, all started in 1882, followed by summaries of sample cases. There is considerable variation in the amount and quality of information in the files, many containing just the application form often only partially completed, with brief notes of any subsequent moves on the back of the form. Some files contain correspondence, often about maintenance payments. 69 boys and 31 girls made up the first 100 cases. They included two families of three siblings, and one pair of sisters and one pair of brothers. Almost half the children were 7, 8 or 9 years old. Five were babies under 2; thirteen were 14 years or older. The ages of many children were estimated, particularly in cases of abandonment. Four of the children were declared illegitimate, although several more may have been. All but five applications were from London, mostly from inner London, particularly the East End. The others were from Sussex (2), Kent, Oxford and Suffolk. There are multiple applications by H Thornhill Roxby, a young man of independent means from Clapton, who found many destitute boys found sleeping rough around inner London, and worked closely with the Rector of Spitalfields Church in the East-End. Most of the children had lost at least one parent, usually their father – 24 were orphans. Sixteen fathers had died in accidents, mostly at work; nine of them drowned, a common risk then of working on the Thames. Tuberculosis features regularly as the cause of parental deaths, particularly for mothers. Sunstroke was responsible for two parental deaths while on military service in India. There are six cases of child abandonment, generally early teenage boys being left to fend for themselves. Parental desertion is mentioned in six other cases, three cases of paternal desertion and one of a mother leaving her three children. Poverty and the sheer struggle to support large families come across in most cases. There are a few cases of children becoming difficult to control and falling into “bad company” with their widowed mother or widower father out of the home working from early morning until late evening. Truancy is mentioned a couple of times. There is one application to avoid the physical behaviour an aunt. An element of moral guardianship by the church authorities that referred cases to The Society is evident in several cases. Drunkenness is mentioned in six times, in one of which the father “went wrong”, the mother “drinks” and the sister leads a “bad life”. “Perniciousness” of her new home is referred to in the case of a girl whose father had drowned. Theft occurs in ten cases. Most of the children initially went into the receiving homes in Clapton for boys and Dulwich for girls. They were then often transferred to other children’s homes, five of the first fifty going on to St Mark’s Home in Kendal, Cumbria. 22 went to foster homes, with five of them going to Dorset. Fifteen ran away from their placement. 42 eventually returned to their families or friends. Seven children emigrated, five to Canada and two to America. Six more were proposed or considered for emigration, but refused to go. Compulsory school attendance had been introduced in 1880 for children aged 5–10 years. Ensuring children attended school proved difficult, as for poorer families it was more tempting to have them working if the opportunity to earn an extra income was available. 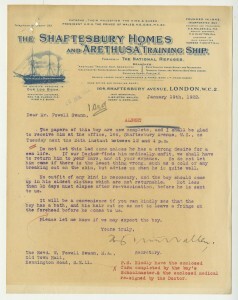 Children under the age of 13 who were employed were required to have a certificate to show they had reached the educational standard. Many of the cases refer to children working in various jobs including crossing sweeper, working on sewers, and being in the shoeblack brigade. 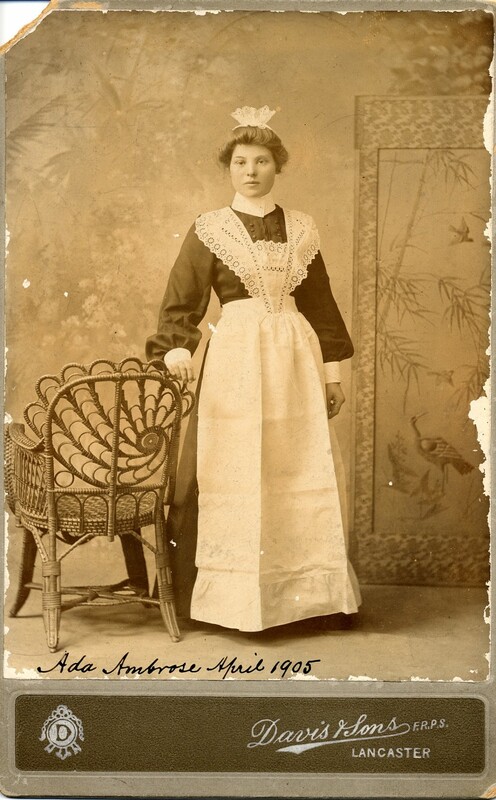 This girl was just about to start her career in domestic service, 1910. During her 12 years at the Bolton-le-Sands Home, she would have been well trained for her new life. Nineteen girls and twelve boys went on to become domestic servants, most of them well away from London. Nine boys went to sea, two of them in the navy, although one had to quickly abandon that career on account of acute seasickness. Other occupations mentioned were carpentry and hairdressing for boys and dressmaking for girls. Part two of the blog will look at the stories of seven of the first one hundred children. 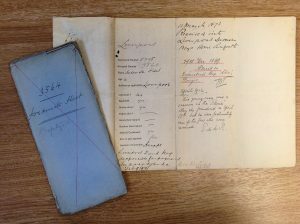 The Children’s Society Archive has just celebrated the completion of its Wellcome Trust funded ‘Unexplored Riches in Medical History Project’. 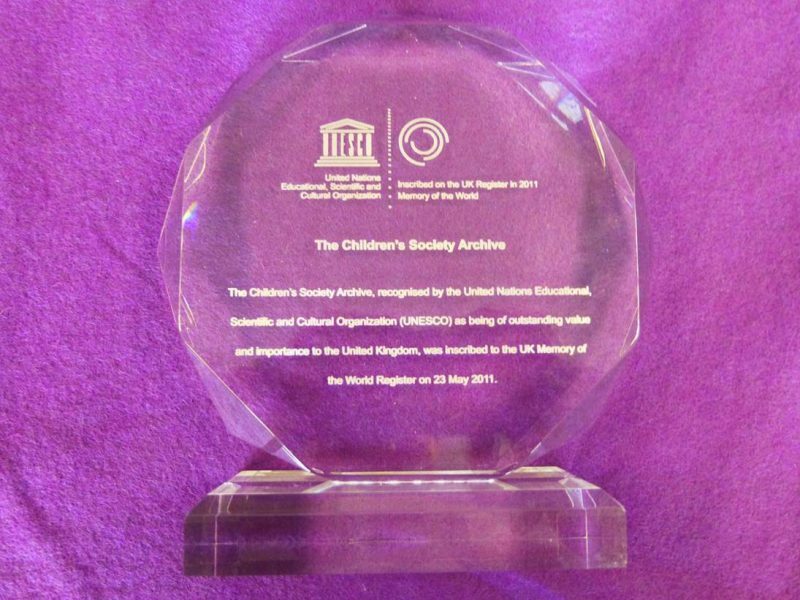 The project was funded by a major grant from the Wellcome Trust and has shed a whole new light on aspects of the well-being and health of children up to the 1920s, as well as their care and social circumstances. Thanks to the funding, the project has conserved and catalogued a significant part of the archive collection, helping to preserve it for the future and open it up for social history and medical history research, while making it more accessible to others, such as schools, universities and community groups. Looking at children’s case files from the 1880s to the 1920s they found a huge body of evidence for the diseases and treatments of the Victorian and Edwardian eras. This included: high rates of tuberculosis and rickets, and high rates of malnutrition in children coming into care. 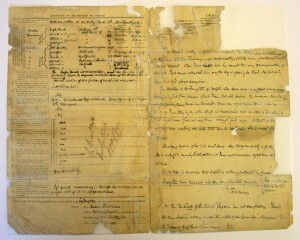 Documents from The Children’s Society’s homes that ran from the 1880s to the 1980s show how The Children’s Society set up homes to treat orthopaedic conditions and diabetic children, as well as creating swimming techniques for children with mobility difficulties. 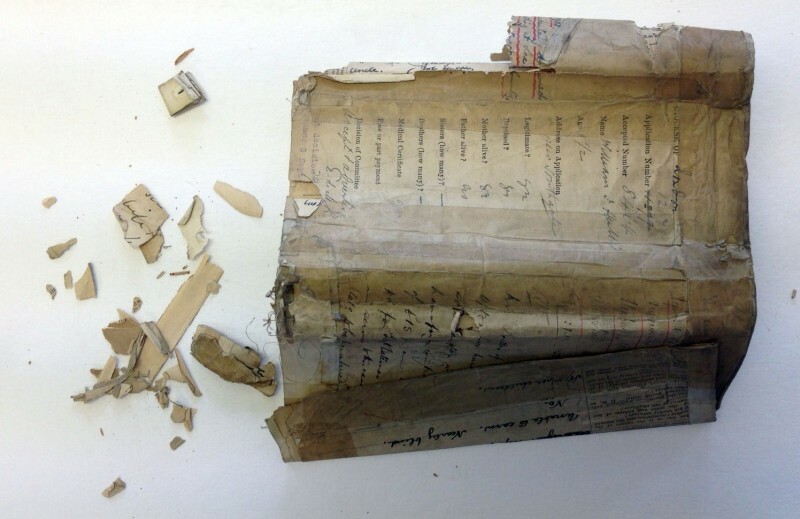 Nearly 9,000 of the earliest case files were in very poor condition, and the project has conserved and strengthened these files for the future. 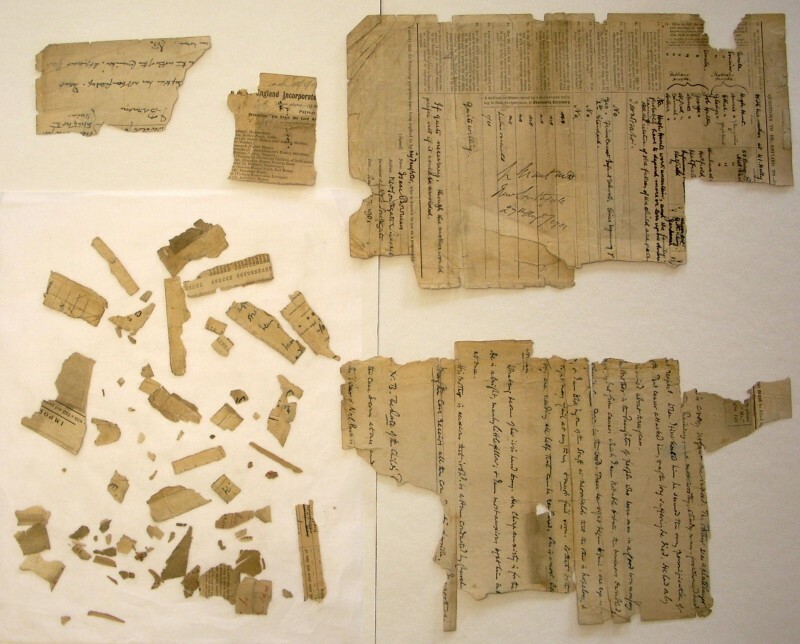 The project was carried out by a professional team consisting of an archivist and two conservators, along with a team of volunteers. Early in 2014 The Children’s Society Archive was contacted by the Legacies Team who wondered if we could shed any light on a mysterious find. One of the team had unearthed a ship’s clock from a cupboard with some information that it came from the Bede Home in Wakefield, West Yorkshire and was dedicated to the memory of Kenneth Humphries, a former resident of the Home, following his death in 1953. They hoped we could supply some further details about Kenneth. By an extraordinary co-incidence at that very time I was looking into Kenneth’s case as his half brothers had requested information on his time in the Society’s care. Kenneth’s brothers had not known a great deal about him when they first enquired; not even his name. They were aware that he had been born to their mother, Margarita Humphries, some years before she married their father, and as she herself had been looked after by The Waifs and Strays Society for most of her childhood, it seemed likely that we would have some information on his birth. (The Children’s Society was known as The Waifs and Strays Society until 1946.) Margarita had died in 2001. From the details they supplied I was able to find substantial case files for both Margarita and her son, Kenneth. Kenneth’s brothers were delighted. They were keen to find Kenneth and incorporate him into their family. 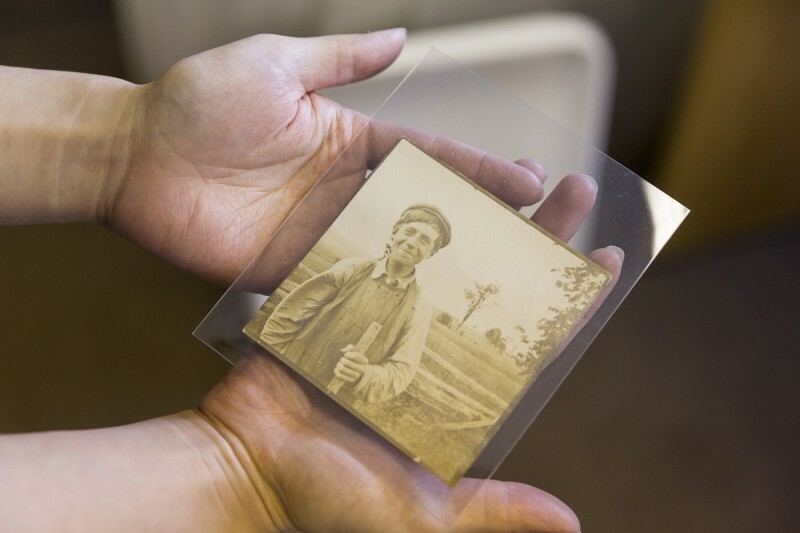 For more historic cases, part of the service we offer to relatives of those people formerly in our care, is to provide a summary account of their family member’s time with the Society. 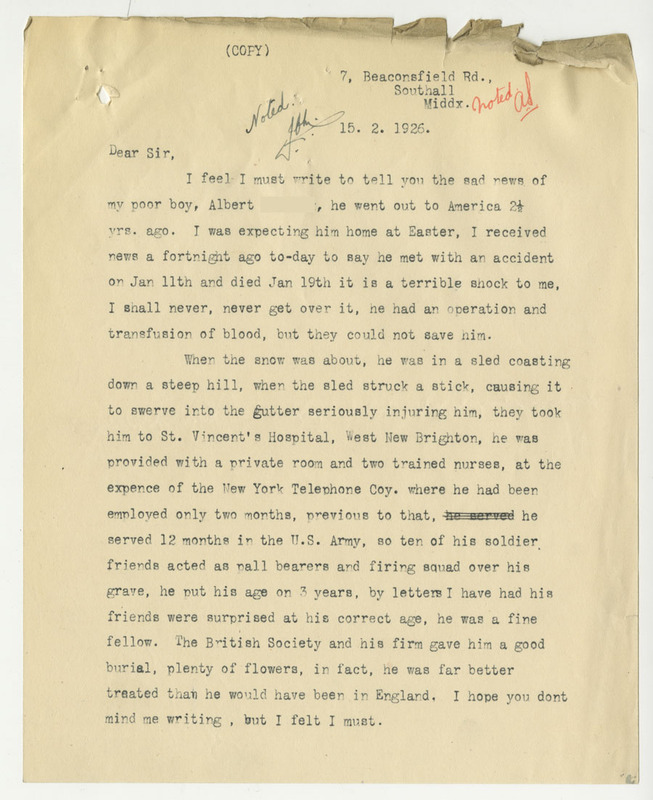 As I started to read Margarita’s file it became evident that she and her family had a very hard time in the difficult conditions of post First World War London. Margarita was born in February 1918: her mother, Emily, was unmarried at the time and it appears that her father, who was a sailor, was drowned shortly afterwards, another casualty of the War. Emily married a labourer, Ernest Eddy, and had another daughter but the family struggled to earn enough to live on: Margarita’s stepfather was often out of work and they faced eviction from their home in Ealing because they could not pay the rent. In desperation they asked if Margarita could be taken into a Home and were helped to make an application to The Waifs and Strays Society. 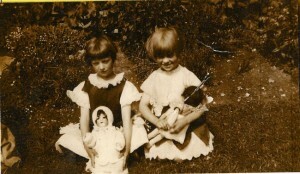 The little girl was accepted and was admitted to St Elizabeth’s Receiving Home, Clapham, in September 1924. Life did not improve for her parents. 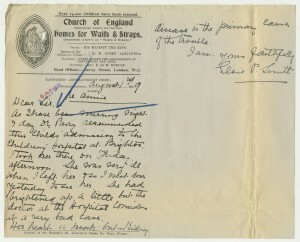 Emily became ill and died in hospital in November 1924 and Ernest was reduced to living in common lodging houses, taking temporary work when he could find it. Margarita’s half sister was sent to live with her grandmother. The Society agreed to continue looking after Margarita free of charge, as there was no other family to help. After a spell in foster care Margarita was sent to St Agatha’s Home, Princes Risborough, in September 1926 and she remained there until she went out to work. She was described as “a nice little girl” and seems to have had a fairly happy time in the Home. When she was aged 17, Margarita was found a job in domestic service but this type of work did not suit her and in March 1934 the Society eventually found work for her in a small private laundry in Sussex. Margarita was popular with her employers as she had a pleasant personality; however they noted that (in common with many people) she preferred going to the pictures to working! It was while she was working in Sussex that Margarita became pregnant; sadly she found herself abandoned by her boyfriend who refused to admit responsibility for the pregnancy. Her employers were sympathetic but requested her removal. The Society after-care workers stepped in to help her and together with a local welfare society found her a place in a Maternity Home. It was in this Home in Eastbourne that Kenneth was born in February 1936. Margarita was a devoted mother and kept in close touch with Mrs Phillips, who worked for The Waifs and Strays Society as the Girls Welfare Secretary, and who was delighted that Margarita was so happy with Kenneth. Mrs Phillips hoped the baby would “be a real anchor” for Margarita. Unfortunately life later became increasingly difficult for Margarita. As was the usual procedure at the time, in June 1937, Kenneth was placed with a foster mother. Margarita was expected to earn her living and make some contributions towards the maintenance of her child. The Society helped her by making a grant of 7 shillings a week. Over the next few years Margarita found it difficult to keep a job and make the payments and she worried about what was best for Kenneth. She loved him but thought that perhaps he would have a better chance if he was adopted; however she did not pursue this option. When Kenneth’s foster mother could no longer keep him and there was a danger of him being transferred to the successors of the Workhouse authorities, the Society officially took over his care in September 1938 and shortly afterwards assumed complete financial responsibility for him. In November 1939 Margarita was employed in one of the Society’s Homes as a housemaid and encouraged to visit her son regularly. In the maelstrom of the Second World War Margarita lost touch with the Society. She married in 1942 and went on to have four more sons. Kenneth grew up with foster parents and later in the Society’s Homes. He was a bright, mischievous boy who was predicted to grow into “a fine young man”. In 1950 Kenneth was in the Bede Home in Wakefield and when discussion of his future career came up he told the Master of the Home, Mr Flynn, that he wanted to join the Royal Navy. He was successful in the entrance examination and entered the Navy in April 1951. Very sadly, in February 1953, the Society was informed that Kenneth had been severely injured in an explosion on board HMS “Indomitable” while it was at Malta. 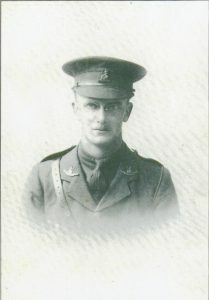 Mr Flynn flew out to Malta to be with him but he died on 7 February. He was just 17 years old. Everyone at the Society was extremely distressed as Kenneth had been in their care virtually all his life. Mr Flynn gave an account of Kenneth’s last days: he had been very brave, thinking first of his fellow sailors although his own injuries were so severe. He received a full Naval funeral and was buried in the cemetery in Malta. The Society established a Trust in Kenneth’s memory and each year a prize was awarded to a boy at the Bede Home who had done well that year. A photograph of the ship was supplied by the Navy and was displayed in the Home and it appears that the ship’s clock was also kept as a memorial. Once the Home closed the clock was sent to the Headquarters of the Society for safekeeping and there it remained until it was rediscovered by the Legacies Team at the precise time that Kenneth’s brothers were following up his trail. It was obviously very sad for Kenneth’s brothers to learn of his early death; they had been hoping to meet him and welcome him into the family. 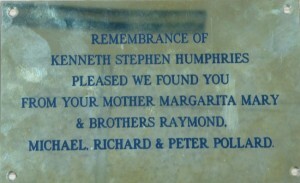 Sadness, however, could at least mix with pride at how much Kenneth had been valued by the Society and the Navy. 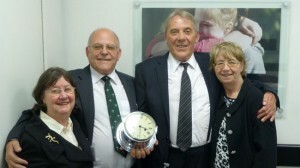 We presented them with the clock that had been a memorial to the brother they never met and they were pleased to have this link with him. On 20 May 2014 Michael and Richard Pollard and their wives, Valerie and Rosie, came to Edward Rudolf House to receive the clock. This was a rewarding chance to meet some enquirers and to allow us to understand what had happened to Margarita after she lost contact with the Society. Michael supplied copies of photographs of the family, including some delightful ones of his mother at St Agatha’s Home (shown above). 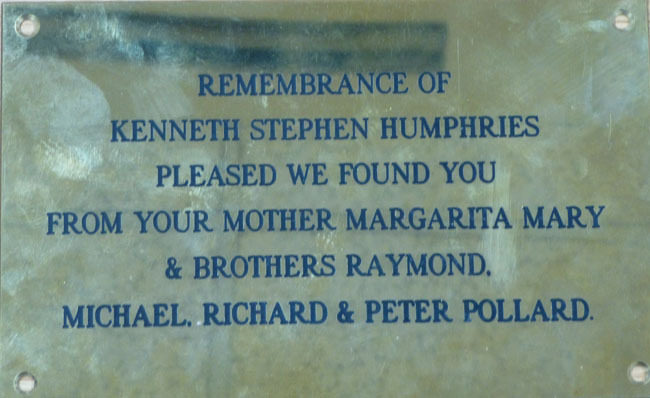 As a touching tribute to Kenneth the family had had a memorial plaque made and it has now been placed in the cemetery following their visit to Kenneth’s grave, in the summer of 2014. The plaque tells Kenneth that his family is pleased to have found him at last, and it is good that The Children’s Society was able to play a part in this closing of the circle. This week I’ve been tracing lives through the Historic Hospital Admissions Registers Project (HHARP). The HHARP website contains a database of children who went to 19th Century children’s hospitals, and I wanted to see if any of those children were also in the care of The Children’s Society (known as the Waifs and Strays Society until 1946). 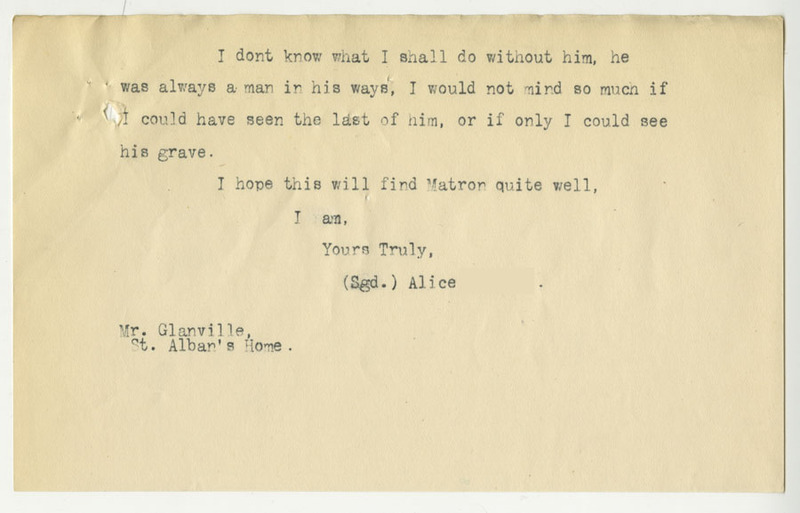 I found a few children in the database that could be matched to our case files here at The Children’s Society Archive, and today I’m going to tell you about one of them. John went to hospital with a deformity in his feet, which is described in John’s case file as both club feet and flat feet. He had had polio (also known as infantile paralysis) when he was younger, which is likely what had affected his feet. In October 1911, the HHARP website lists John as entering Great Ormond Street Hospital in London. He was four years old and had been living at the Home for Sick Children in Battledown, Gloucestershire (this was a home that wasn’t operated by The Children’s Society). John stayed in hospital for about two months to have treatment for his feet. 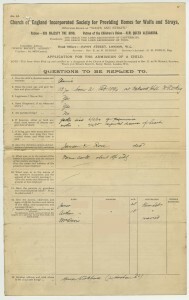 While in hospital, an application was made for John to enter the care of The Children’s Society. It appears that the whereabouts of John’s parents and family was unknown. They had last been heard of in Winchcombe in Gloucestershire but they hadn’t been in contact while John was in the Battledown children’s home, and it had been assumed that the family had abandoned him. John was discharged back to the Battledown home in December, and was described as “cured”. 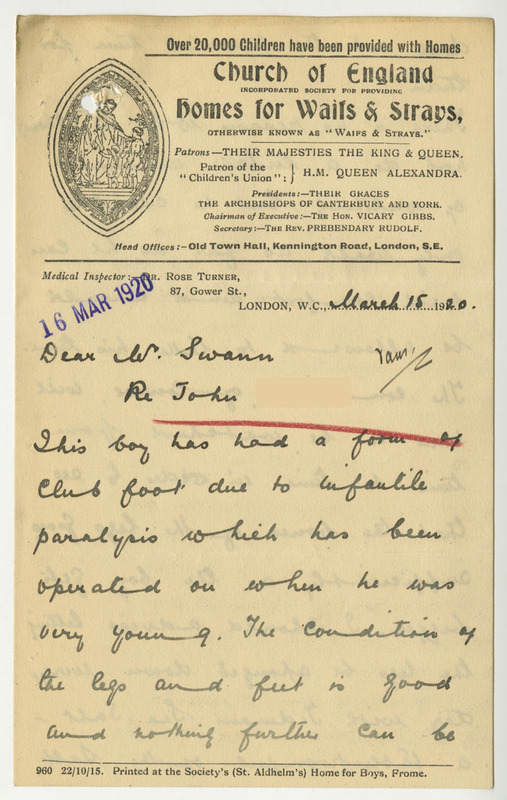 One month later, in January 1912, John re-entered Great Ormond Street Hospital in order to have more treatment for his feet. This time he was in hospital for just two days and was discharged back to Battledown with his condition described as “relieved”. 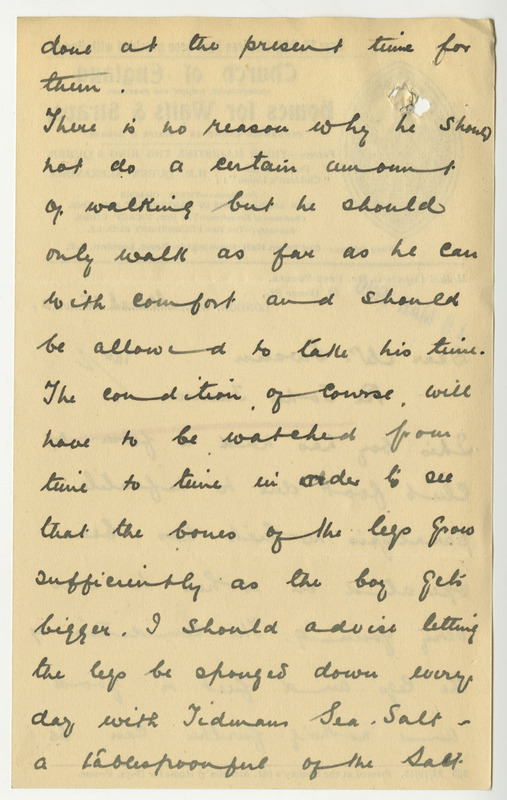 In one of his two hospital stays, it seems that John had undergone an operation on his feet. 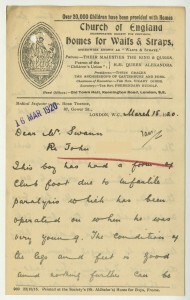 As he was still recuperating from the surgery, the application to The Children’s Society was put on hold for a while. 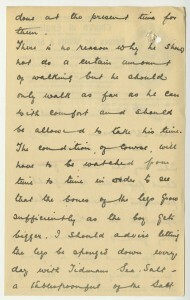 By August 1912, John was able to “walk splendidly”. His application to The Children’s Society was restarted and in October, aged 5, he went to live in The Children’s Society’s St Nicholas’ Orthopaedic Hospital and Special School in Pyrford, Surrey. 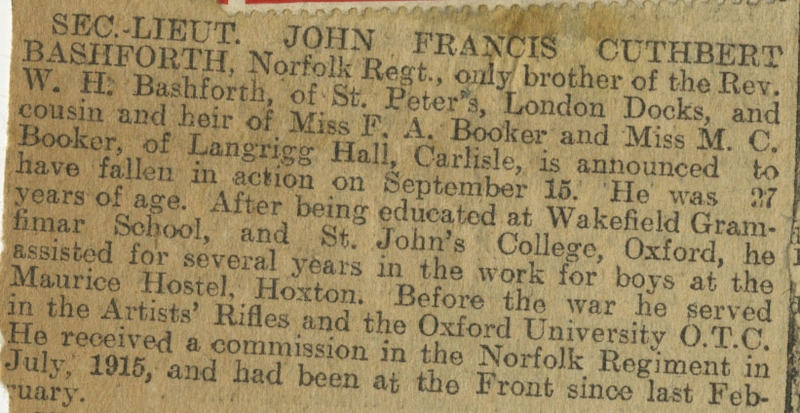 John stayed in this home for about a year and a half and then, in 1914, he went to live in a foster home in Frettenham, Norfolk, along with another boy from St Nicholas’ Home. At this point, John was seven years old and we know that he was attending the local school while he was in foster care. Correspondence in our case file for John tells us that he received a medical examination at school, and that a doctor from The Children’s Society also came to see him. 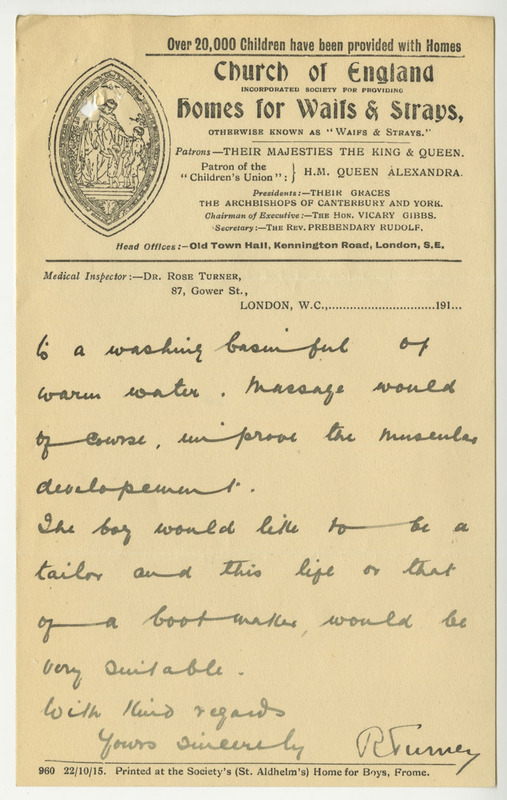 One of the doctors prescribed special boots for John’s feet and the other prescribed exercises for John to do; we don’t know what exercises these were, but we do know that the boots cost 15 shillings, 10 shillings of which were donated by a local person in Frettenham. For a number of years, there’s little medical information to be found in John’s case file. He stayed in foster care in Frettenham until 1920 when he was twelve years old. It was normal for children at the age of twelve to leave foster care and go live in a children’s home where they could begin to learn a trade. And so, at the age of twelve, John left Frettenham and went to Peckham Receiving Home for Boys in London, which was a home that boys normally stayed in temporarily before moving on to other children’s homes. be allowed to take his time. Dr Turner’s recommendations are wonderfully detailed. We see that she recommends massage for John’s legs, which seems like something a child could be prescribed today. She also recommends bathing John’s legs in a salt solution, which is a little more unusual. I’m not sure what the purpose of this salt-bathing would be; let me know in the comments if you have any ideas! John stayed in Peckham Receiving Home while a place was found for him elsewhere. After a few months he went to St Andrew’s Home for Boys in Matlock, Derbyshire. However, after only three months there it was clear that St Andrew’s Home wasn’t well-equipped to look after a boy like John who had difficulty walking. As a result, John was sent back to Peckham Receiving Home. Once again enquiries were made as to a suitable children’s home for John. John wanted to become a tailor, and so he was sent to St Benet’s Home for Boys at Emmer Green, Berkshire, where they taught tailoring skills. 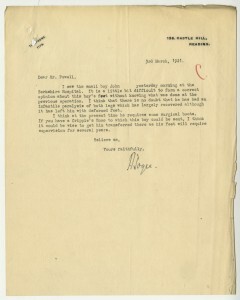 The surgeon recommended that John have special boots again, and suggested that John be sent to a home that would provide him with specialist medical supervision. Once again, we find that the home John was currently living in was not equipped to look after boys with conditions like his. And so, for the third time, John was sent to Peckham Receiving Home. He was there for only a short while this time before being sent to St Martin’s Orthopaedic Hospital and Special School in Pyrford, Surrey. This home was next door to St Nicholas’ Home which John had lived in when he had first entered the care of The Children’s Society. Like St Nicholas’ Home, St Martin’s also specialised in looking after children with orthopaedic conditions; St Martin’s, however, took in older boys and often taught them trades such as tailoring. Finally, John was able to settle down in a home for a decent period of time. He stayed at St Martin’s for three years until 1924 when he was seventeen years old. 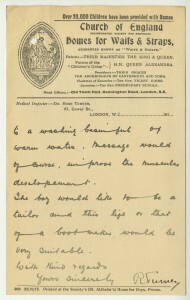 By 1924 John’s feet were described as cured and a report states that he had completed his training in tailoring. For a job, however, John had since decided that he would rather work as a servant than as a tailor. There was initially some difficulty in finding John a job. He had a speech impediment which led some potential employers to turn him down because they didn’t think him suitable for answering the door to visitors. 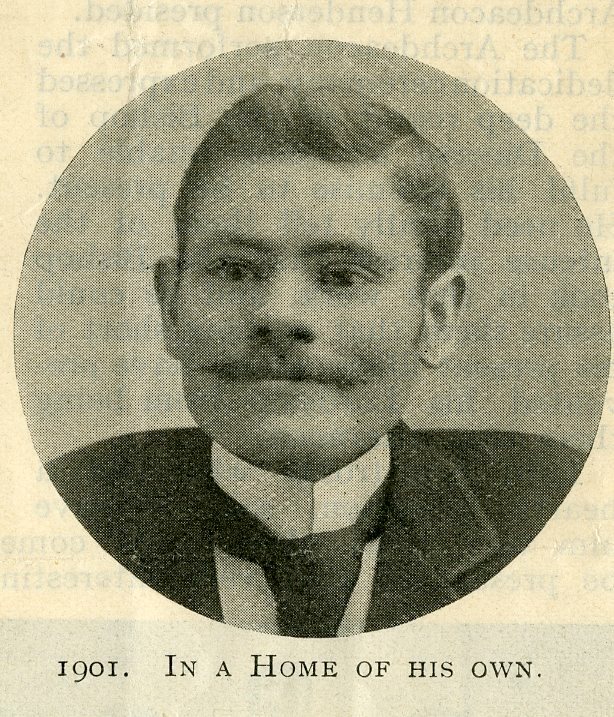 In order to increase his job prospects, John returned to Peckham Receiving Home, as this home was often used as a temporary home for boys looking for work. It was successful. After just two days in Peckham, John went to work as a hall boy in Pimlico in London, earning seven shillings and sixpence a week. John stayed in this job for about a month and a half. We don’t know why he left, but he soon went to another job on a farm in Plumpton, Sussex, earning six shillings a week. John started this job in July 1924 and stayed there until Christmas 1924 when he returned to Peckham Receiving Home for a brief holiday. However, when in Peckham, John said that he didn’t want to go back to the farm in Plumpton but instead wanted to go live with his father. 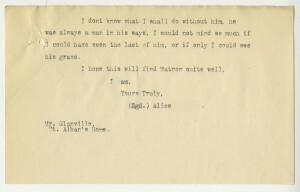 John’s father had just sent John a letter. After a number of enquiries over the previous year, The Children’s Society had finally tracked down John’s family. They found that John’s father and siblings had moved away from Winchcombe in Gloucestershire and had gone to live in Llantwit Fardre in Glamorgan. John’s mother had died, leaving John’s father and John’s eldest sister to look after John’s five other siblings. They were struggling to get by, and when their house was condemned as unfit for habitation, John’s father had become homeless and John’s siblings had been sent to a children’s home nearby. Previously, when John had been struggling to find work, it was suggested that he could go live with his father, but the local vicar of Llantwit Fardre warned that “It would be fatal to send the boy home under the circumstances”. 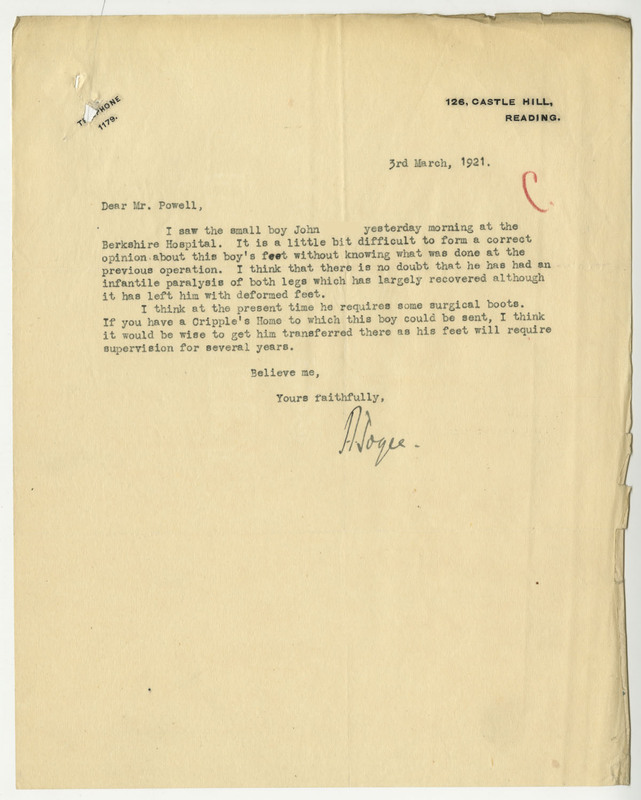 It is understandable, then, that when John returned to Peckham in Christmas 1924 and said that he wanted to go live with his father, The Children’s Society didn’t let him go straight away. Instead, in January 1925, John went to work in another job as an under butler in a college in Chelsea, London, earning six shillings a week. 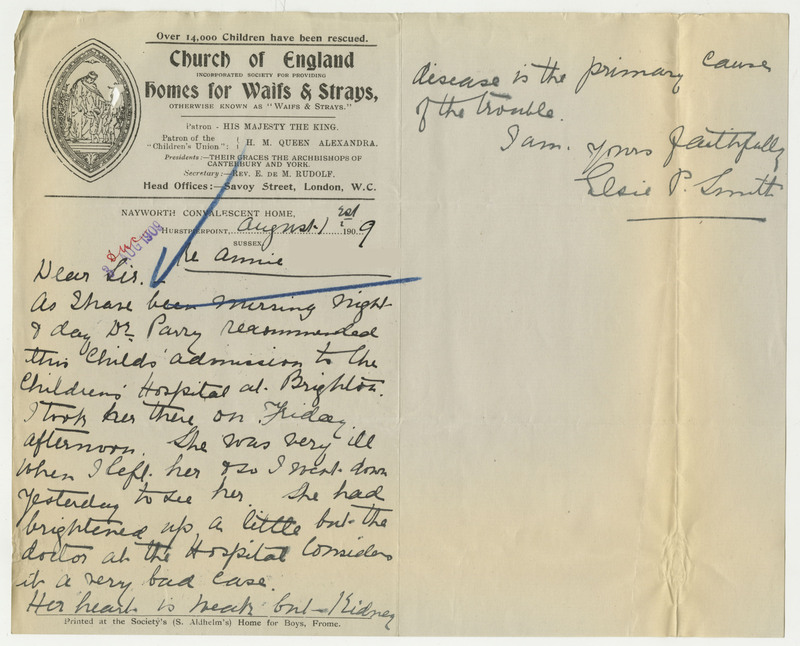 Meanwhile, The Children’s Society wrote to the vicar of Llantwit Fardre to see if John’s father’s circumstances had improved and if it would be possible for John to go live with him. Unfortunately, John’s case file ends there so we don’t know what happened next. Did John stay working as an under butler in Chelsea or did he go to live with his father in Llantwit Fardre? Presumably John thought that he’d be able to help his father earn money to support the family, but it wouldn’t have been easy if they had nowhere to live. And why did John’s family never contact him when he was first put into a children’s home all those years ago? Were their circumstances as dire in 1911 as they were in 1924? It seems that John’s story still has more to tell. Despite the gaps in our information, what have we been able to learn? Firstly we have seen just how fascinating it is to link our records to those of Great Ormond Street Hospital using the HHARP website. We can follow John’s treatment from surgery in hospital through to orthopaedic boots, to massage and to bathing in salt water. 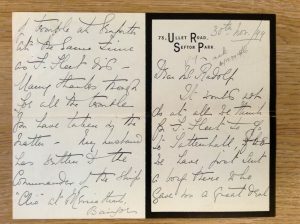 By the end of his file in 1925, it seems that all the treatments had paid off, with John gaining enough mobility to work as a servant. What seems most clear to me though, is just how difficult it must have been for John and for other disabled children in similar situations. With John’s difficulty walking, it seems that there were many children’s homes which just weren’t able or weren’t willing to look after him. This led to a long period of being shuttled back and forth from one children’s home to another, which for John must have been as disheartening as it was unsettling. Then, when looking for work a few years later, we find that John’s speech impediment was another thing that caused people to discriminate against him. John’s story is not an easy one to read. It does, however, give us an insight into social attitudes at the time. Have a search of the Historic Hospital Admissions Registers Project (HHARP) website for yourself and discover the children’s stories there.